The rebel scene in southern Syria is dominated by factions that come under the broad 'Southern Front' coalition, which has been tied to an operations room (MOC) based in Amman. Though the Islamic State has managed to cultivate an affiliate in the southwest corner of Deraa province (Jaysh Khalid bin al-Waleed), tight Jordanian border controls have generally helped to limit jihadist influence in the south. The faction Jund al-Malahem ('Soldiers of the Epic Battles') presents an interesting case of one of the few independent factions in the south. Jund al-Malahem originated in part as a break-off from al-Qa'ida affiliate Jabhat al-Nusra, as the defectors rejected what they perceived to be the extremism and tyrannical conduct of Iyad al-Toubasi (Abu Julaybib), who is of Jordanian origin and was Jabhat al-Nusra's leading military official in the south. Abu Julaybib was eventually transferred by Jabhat al-Nusra to the north of Syria. Sami al-Oraidi, another Jordanian who served as Jabhat al-Nusra's general Shari'i official, was also transferred to the north. 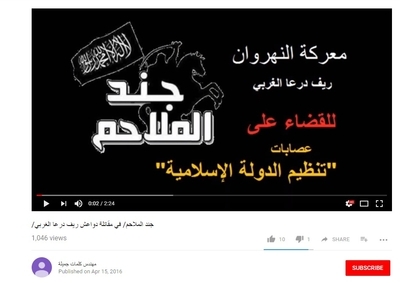 Today, both men can be seen as 'al-Qaeda loyalists' in the dispute between Hay'at Tahrir al-Sham and al-Qaeda. Jund al-Malahem's social media profile has been somewhat limited. 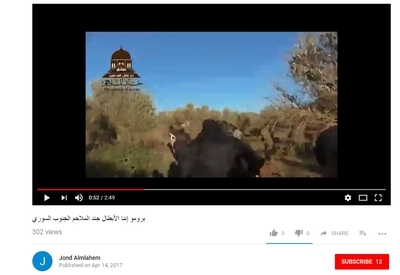 From 2017, the most notable items of social media output from Jund al-Malahem were a series of rulings and decisions issued by the group's leadership and some promotional videos of training and military activities. As a Jund al-Malahem Shari'i official (i.e. responsible for moral/spiritual direction for members) put it to me in May 2018, Jund al-Malahem's capabilities today are very limited. Thus, according to him, the faction only functions as a military group, lacking da'wa and relief offices. He added that salary payments for members of Jund al-Malahem have ceased since the last Eid al-Adha. Incidentally, this Shari'i official had previously been an amir for Jabhat al-Nusra in Deraa. It should be noted that claims that Jund al-Malahem joined Ahrar al-Sham in late June 2015 were erroneous. Although there was an intention for Jund al-Malahem to join Ahrar al-Sham, a final agreement was never reached. Jund al-Malahem, whose presence is strongest in the east Deraa locality of Nahtah, also uses the name Jund al-Thawra ('Soldiers of the Revolution'). The group is led by one Dr. al-Qadiri, who became leader of Jund al-Malahem around just over a year ago. I was able to interview Dr. al-Qadiri in May 2018 regarding Jund al-Malahem and the situation in the south. Any inserted explanations of terms and phrases are in square brackets. Note that he requested that I omit his full name. Q: Can you describe the history of Jund al-Malahem? A: The faction Jund al-Thawra or Jund al-Malahem was established in southern Syria around 4 years ago as a response to the extremism and tyranny of Jabhat al-Nusra in Deraa, and it was formed under the leadership of a number of revolutionary military commanders from the sons of Hawran. And Jund al-Malahem was exposed at the beginning of its establishment to attempts to isolate it and destroy it at the hands of Jabhat al-Nusra led by the terrorist criminal Iyad al-Toubasi (Abu Julaybib). On account of that and in response to the wish of the sons of Hawran for this popularly desired faction to continue, revolutionary groups from the Free Army and cultured cadres from doctors and academics opposing the ideology of al-Qaeda and its presence and negative role in Syria joined this faction. * And the aim of that was to strengthen this nascent, popular, revolutionary faction and prevent attacks against it and strengthen its role in leading battles in Hawran and Quneitra against the regime on one hand and the extremists and Dawa'esh [Islamic State followers] on the other. And indeed this faction managed to lead the most important battles of liberation in Hawran and Quneitra and that was because of the capable, revolutionary leaders and cadres and disciplined, compliant soldiers trained to a high level in assault and commando raids against the enemy. For from the battle of the Triangle of Death in 2015 in Quneitra with the terrorist Shi'i militias which inflicted severe losses on these criminal militias and halted their advance to the battle to liberate the town of al-Sheikh Maskeen from the terrorist Shi'i militias and the criminal regime, and thereafter Jund al-Malahem pursued the great battle in Busra al-Sham in coordination with Shabab al-Sunna and factions of the Free Army, which led to the liberation of the historic town in its entirety from the terrorist Shi'i militias that controlled it and were causing havoc in it. From there, there was the battle of Liwa 52, the second biggest armoured brigade [Liwa: brigade base] in Syria, as al-Jund [Jund al-Malahem, so with all other 'al-Jund' references here] led the planning and assault operations for this Liwa in cooperation with other factions, which led to its liberation and the liberation of multiple localities and villages neighbouring it and the breaking of the siege of Hawran by opening the eastern gates to Deraa. Then there were the battles to seize the hills neighbouring the city of Quneitra and the Taranja sarya [sarya: a kind of military outpost] that was subsequently lost. In these battles we lost the courageous commander Ahmad al-Mahaimid. Then there were the battles to seize Tel al-Hamriya in Jubatha al-Khashab led by al-Jund and factions of the Free Army. During these battles we lost the head of the media office and the distinguished, accredited cadre Muhammad Ali al-Hariri. Screenshot from Jund al-Malahem video on fighting Islamic State in west Deraa countryside. At the same time the battles of Jund al-Malahem were continuing against the Da'esh [Islamic State] organization in the Yarmouk Basin and in the al-Lajat area, for during the years 2015-2016 the faction led the most important battles against the Dawa'esh in the Yarmouk Basin as it managed to liberate the sarya of Ain Dhikr and the Maqraz dam. ** These places remain liberated to this day and during these battles with the Dawa'esh the Jund al-Malahem faction lost the best of its military commanders: among them we mention the heroic commander Mu'ammar al-Maf'alani, the heroic commander Abu al-Waleed and the heroic commander Sayf al-Maf'alani. Then al-Jund participated in the liberation of the al-Lajat area from the Dawa'esh and their expulsion from it after ribat and battles that lasted for more than 2 years. Then the faction participated in the forefront of the factions in the liberation of the al-Manshiya neighbourhood that was considered the most important stronghold for the Shi'i militias and the militias of al-Assad near the borders with Jordan. *** During these battles we lost the courageous field doctor Fawzat al-Maf'alani. Jund al-Malahem (Jund al-Thawra) has participated and continues to participate in operations to manage security in the liberated areas and fight the drug gangs, organized criminal gangs, kidnapping, and cells of IEDs and cells of Dawa'esh. Q: When was the name changed [to Jund al-Thawra]? A: After new revolutionary groups joined us, we have preferred to use this name for the revolutionary legitimacy it bears since more than a year ago. Q: Yes, but you also use the name Jund al-Malahem? A: People have become accustomed to mention the name Jund al-Malahem. Yes. We use the two names but officially we prefer this name. Q: I had heard that the group originally defected from Jabhat al-Nusra because of Iyad al-Toubasi's extremism. A: Yes, a bloc of the fighters led by Ashraf Fanish defected from Jabhat al-Nusra because of its extremism and tyranny and from there other revolutionary groups hostile to al-Qaeda and its presence in Syria joined it under my leadership and that was to reinforce the decision of the defectors from al-Nusra and to strengthen their resolve. Q: You yourself were in another faction before the formation of Jund al-Malahem? A: I was not in any faction but I was working with the Free Army in a general sense in organizational matters and likewise in medical matters that I have not ceased to work in. Q: Yes. And before the revolution you were working as a doctor in Deraa? A: No, I was travelling, and I have worked as a doctor since the beginning of the revolution. Q: What is the political program of Jund al-Malahem? If Bashar al-Assad is made to leave, what is the type of government that you want in Syria? A: A just government that spreads justice and security for all the sons of the Syrian people regardless of the difference of their religions and ethnicities. Q: Meaning you don't have a problem with the Alawites or Druze for example. Q: Currently what is your analysis of the situation in Syria? It's possible for some people to say that the revolution has been defeated after the regime seized Aleppo. A: We must all strive to remove the terrorist Shi'i militias from our land and the international community must cooperate to achieve that, because the terrorism of these organizations does not differ from the terrorism of Da'esh but also it is more dangerous because the greatest terrorist state Iran stands behind it and supports it. And this state harbours the ambitions of the foolish to control Syria, Yemen and Lebanon and then Jordan and the Gulf. And it works to extort knowledge through its terrorist militias at the head of which are Hezbollah, the Iraqi Shi'i militias and the Houthis. This [talk of the revolution being defeated] is untrue. The revolution has many powerful means of leverage the most important of which is that it is a spontaneous popular revolution, not ideological. And even though some of the organizations infiltrated it and distorted it- like al-Qaeda and Daesh- it [the revolution] was able to expose them, unveil them and reject them. Q: Yes. So you think it is still possible to bring down the regime? A: Of course. A regime that has killed its people and brought every terrorist of the world to its land cannot continue or endure even if it takes some of the areas. Q: Regarding the south, the fighting has ceased more or less. In your opinion the reliance of most of the factions on the MOC is a big mistake? A: [Yes], it has ceased now...The factions relied on the MOC to obtain the necessary support to continue with the battles, but being deprived of revolutionary and national decision-making is a big problem. And this is the revolution's mistake: it has not been able to find a political leadership that truly represents it. Q: Is it true that the support from the MOC has ceased? A: Currently it has ceased and I believe it will return. In the event that the terrorist militias try to assault Deraa, the revolutionaries of Deraa have many tactical choices that will surprise the attacking militias and will dazzle the world in the means of defending the land against the terrorist aggressors. Q: As I understand the support from the MOC continues for the factons that fight Da'esh in the Yarmouk Basin? Q: So currently there is no support for the factions that fight Da'esh in the Yarmouk Basin? A: No, there is none. We are among the factions that fight and we have no support. Q: Currently you are on the Yarmouk Basin fronts? I thought that Jund al-Malahem withdrew because of the lack of support. A: We participate in a simple form with Liwa al-Faruq in Nawa because of the lack of support. Q: Is it true that the salaries of members of Jund al-Malahem have ceased? A: Jund al-Malahem had no support from the MOC. They do not have salaries. Q: True, not from the MOC. But there were salaries previously. A: They relied on local supporters: donations from the people. But the state of affairs has oppressed them and the people. May God bring them deliverance. Q: Yes. I heard that the salaries were from businessmen of the area. A: More or less so. Hey, you know everything. Who told you this information? Are you a journalist or interrogator?! Q: I spoke to a Shari'i from Jund al-Malahem and he told me this. Q: Currently is Jund al-Malahem spread in all of Deraa and Quneitra? Q: Brother, what is your opinion on the American withdrawal from the nuclear agreement? A: Excellent. I believe this is the beginning of the end of the criminal Iranian regime. And now it [America] is commencing sanctions against it and it will commence a war to get them out of Syria. Q: Do you believe Israel can play a positive role in Syria? A: Israel defends its interests. And it does not want Iran to vie with it in the area. A conflict of interests. Q: Yes. But maybe Israel can help in bringing down the regime? Or Israel does not want that? Q: Yes, true. Does Jund al-Malahem offer any public or da'wa services in the area? Or is its presence a military presence only? A: Military in the first degree in addition to protecting the localities in which it is present against thieves, smugglers of drugs, highwaymen and sowers of corruption, while participating in some of the social sporting activities like football, swimming and running. Q: But the faction has no relief office currently? A: No, there is none regrettably. If there were such capabilities, we would work and help the people. Q: Yes. So there are three types of members in the faction. Ordinary member, Shari'i, commander. A: There is no Shari'i. We have moral direction. Q: Yes, that is what I mean regarding a Shari'i. Q: Have some of the youth abandoned the group since the salaries stopped? A: No. Generally the faction is holding together. Q: Can we say that Jund al-Malahem is among the biggest factions of the south? A: No, it is not among the biggest factions of the south. But it has a presence and has cadres. Q: Yes. Have you ever thought of joining the Southern Front? A: Yes. We consider ourselves a part of the Free Army. We work with them and have good relations with the factions. Q: Yes. But you have never joined the MOC? A: We have visited Jordan and we have good relations and it is possible we will be supported in a subsequent stage. Q: Yes. Most of the youth of the group are from a specific area in Deraa (e.g. the eastern countryside)? A: Yes, possibly in the eastern countryside their number is greatest. *- Despite its origins in part as a break-off from Jabhat al-Nusra, Jund al-Malahem sometimes participated alongside Jabhat al-Nusra on the same fighting fronts (e.g. both groups are listed as participants in fighting on the al-Sheikh Maskeen front in January 2016). **- cf. This report by Enab Baladi. ***- On Jund al-Malahem and its participation in the al-Manshiya neighbourhood fighting in 2017, see e.g. this. ****- Even so, Dr. al-Qadiri made clear to me his hostility towards the Shi'a, saying that "the Rafidite Shi'a are the grimmest enemies of the Islamic Ummah. And we have seen this in Iraq and Syria." He said that the Zaydi Shi'a are closest of the Shi'a sects to the Ahl al-Sunna. On the Twelver Shi'a, he said that "they blaspheme against the Companions, defame the honour of the Prophet and think that Ali and the Twelve Imams are infallible, and this is contrary to what the Muslims believe." *****- On the exchange of fire at the Israel-Syria borders in May 2018, Dr. al-Qadiri commented: "I ask God to destroy the oppressors with the oppressors." In his assessment though, "Iran is a greater danger to the Muslims than Israel itself."